Yes, CSRHub LLC, the developer of the CSRHub sustainability ratings web site, now has a CSRHub rating! Fortunately, our scores look pretty good. We appear to be well-governed and to have a positive impact on the community we serve (primarily sustainability professionals and their advisors). Our environmental rating is helped by the fact that we are a virtual company. Each of our team members works out of his or her own home office. This keeps our carbon footprint low and limits our resource use (everything we do internally is via email and file transfer). We have only five sources driving our ratings. This is a low number, but fortunately we did the full B Corp assessment (we got a rating from them of 101—which is very good). This combined with the fact that we belong to a number of sustainability-related organizations and had registered with folks like GreenPages Directory and ImpactSpace gave us enough visible information to allow us to publish our own scores. Of course, as soon as our team and our vendors saw that we were rated, we started to get questions. In particular, a number of team members complained about our low Employee rating. As you can see from the more detailed drill down below, our compensation is a bit low (probably relating to being an early stage, virtual company). Our diversity is good. But, our training, health and safety number is pretty weak. Again, this number doesn’t seem as meaningful in a virtual company setting as it would for a factory or large office building environment. It is unclear what training we’d give our team (they come to us often with remarkably high skill levels that would be hard for us to improve!) or what safety concerns our team faces as they commute to their home offices. Yes, they could trip on the way to the kitchen for a cup of coffee…but it seems hard to hold CSRHub responsible for a dog that bounds into their path or a toy left on the floor! Still, we should have more formal policies on health and safety—and provide longer-term training support for team members who need it. Now that we know where we stand, we intend to ask our team to help us improve in this area. We hope this is an example of how our service can accomplish its mission of encouraging greater corporate social responsibility as we extend our ratings to include smaller, privately held companies. 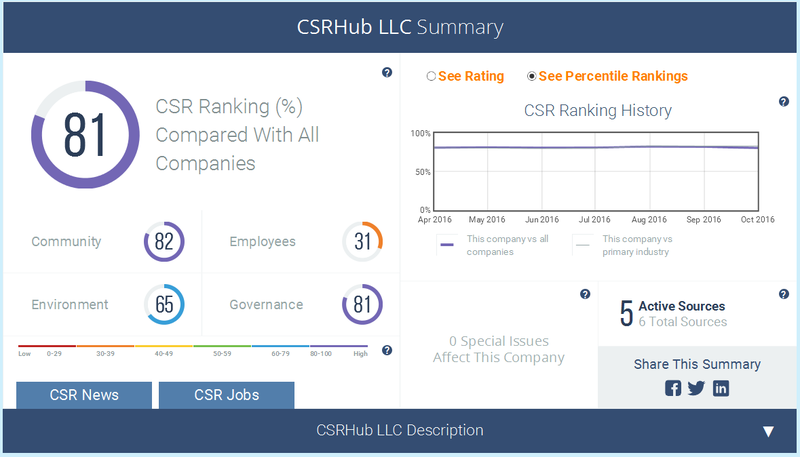 CSRHub provides access to the world’s largest corporate social responsibility and sustainability ratings and information. It covers over 17,000 companies from 135 industries in 133 countries. 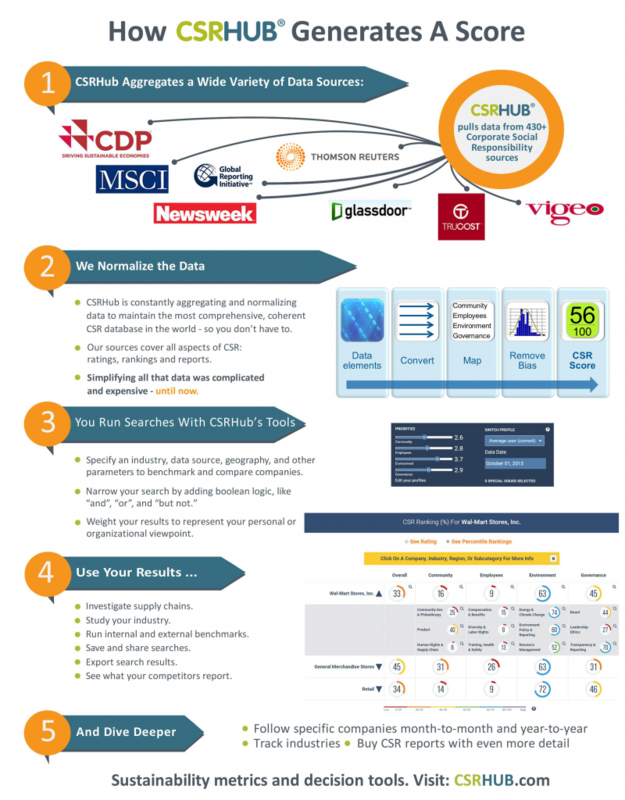 By aggregating and normalizing the information from 500 data sources, CSRHub has created a broad, consistent rating system and a searchable database that links millions of rating elements back to their source. Managers, researchers and activists use CSRHub to benchmark company performance, learn how stakeholders evaluate company CSR practices, and seek ways to improve corporate sustainability performance. Do some states attract more progressive companies while others receive investment from companies who are thought to be less socially progressive? If so, why might this occur? A recent article in Site Selection Magazine used the CSRHub database as part of determining which of 50 US states and 132 non-US countries were most attractive for a new site from a sustainability perspective. This article presents analysis which provides deeper understanding of the corporate social responsibility aspect. Our goal is to make it easier for companies to use sustainability as a site selection criteria and localities to screen siting companies for sustainability, thereby improving their desirability. The CSRHub data set contains estimates of the perceived corporate social responsibility (CSR) performance of more than 16,000 entities. 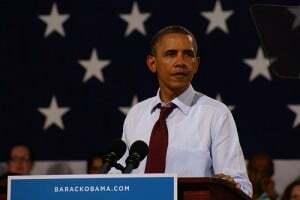 It includes data on both public and private companies and on government entities and not for profits. CSRHub collects information for its big data engine from more than 469 sources and its data set includes companies from 133 countries. For more information on how CSRHub ratings are generated, please see the CSRHub site. 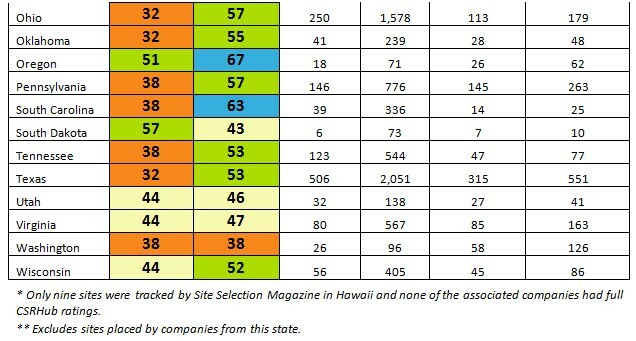 Because many Site Magazine entries were from subsidiaries, a total of 3,073 CSRHub companies connected to at least one site decision entry on the Site Selection list, and 2,217 of these matched companies had full CSRHub scores. These companies were responsible for 5,549 of the site entries—About 55% of these site entries (3,052) were for U.S. sites and the other 45% were for sites in 106 other countries. The average perceived CSR performance for the entities headquartered in that location. 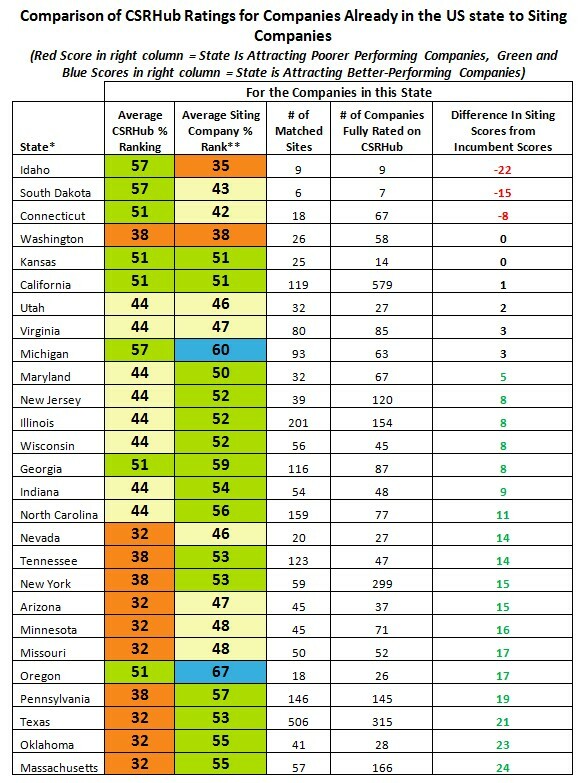 For example, CSRHub found that the 63 fully rated companies in Minnesota had an average percentile rank of 54.8%. Similarly, the 34 companies in Finland have 88% average ranks. (CSRHub tracks a total of 137 companies in Minnesota and 72 companies in Finland. The difference between these numbers shows whether companies selecting sites in a given location are perceived to be more or less sustainable than that location’s current rating. 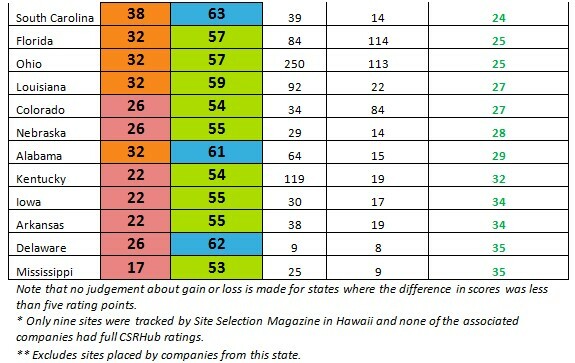 The following table shows the relevant data on both scores for the 39 US states that had at least 5 sites selected by companies outside of the state and at least five companies tracked by CSRHub. The table is sorted in order by the difference between the two scores. Many of the new entrants into these US states came from European companies. European companies have consistently higher sustainability ratings than US companies. Idaho and South Dakota companies already have relatively high scores. They may be seeing lower scores for those siting in their state because they are attracting companies primarily interested in extracting their resources. Connecticut has positioned itself as a business-friendly state and this may have encouraged some lower-ranked companies to enter. 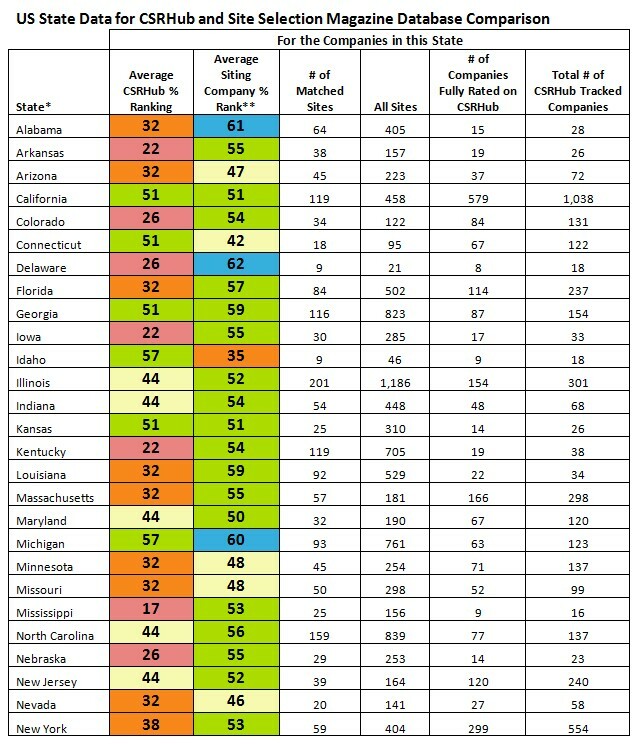 Arkansas, Delaware, and Mississippi all have lower starting scores and are likely to see benefits from encouraging positive companies join their communities. The table below shows the same information for non-US countries. Note that we have narrowed the list to those countries with at least five sites from companies with headquarters outside the country and that have at least five entities that are fully rated by CSRHub. 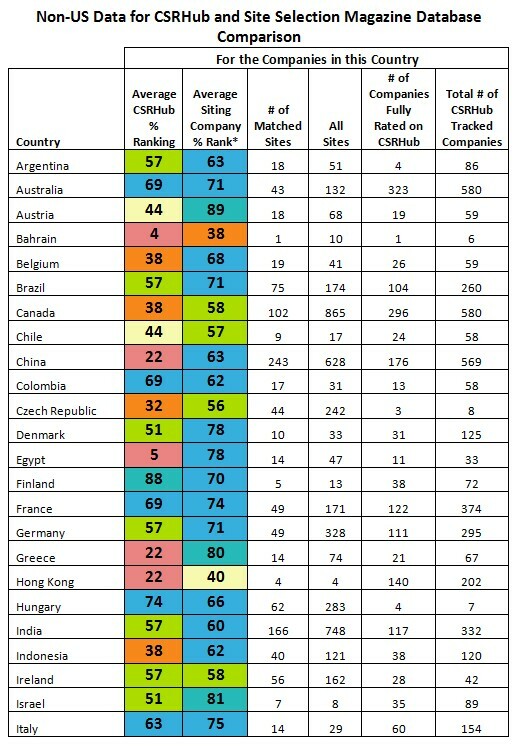 The foreign table shows much bigger differences in the baseline performance of the companies in each country. 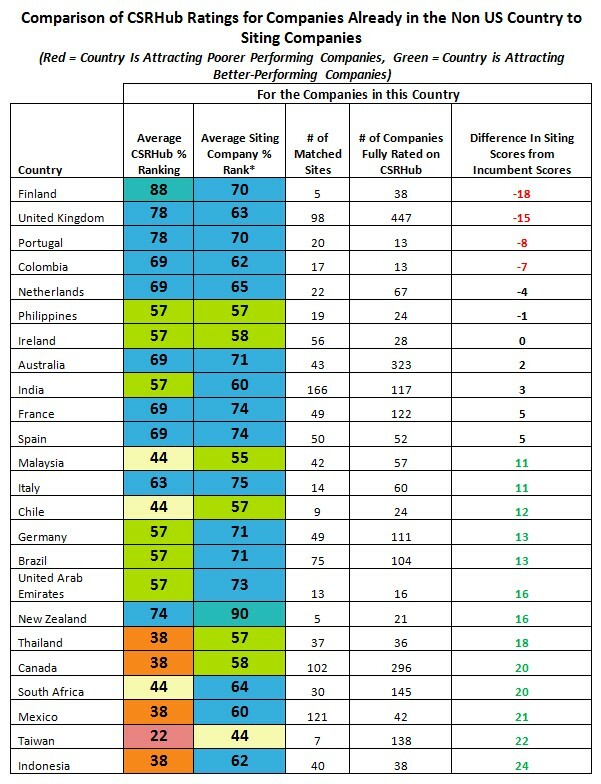 The three countries with the biggest negative differential are those who also have the highest average scores for their existing companies. It is probably difficult for these countries to find many companies outside of their jurisdictions who can match this level of performance. Greece—which has very low scores from its current companies and who is getting huge support and attention from other higher-scoring parts of the EU. Saudi Arabia—which is trying to build a base of sustainable, non-energy-reliant industries. Egypt—which has such weak performance within its existing base of companies that outside companies must generally seem quite attractive. We hope that studies such as the one done by Site Selection Magazine will encourage companies to include sustainability factors in their site research strategies. Our data suggests that the localities who are accepting new sites will generally see candidate companies who are at least as socially positive as the companies who are already in their communities. 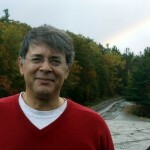 However, it may make sense for localities to screen each candidate carefully and seek to improve their reputation for being a socially positive and sustainable place to put a new site. A number of years ago, CSRHub showed that its measures of corporate sustainability correlate with the level of development of countries. For that study, we used the United Nations Human Development Index (HDI). We found a correlation of 28% for 27 developed countries, but poor correlation with human conditions in less developed countries. Harvard Business School Professor Michael Porter and his colleagues at a group called The Social Progress Imperative have developed a new way of measuring country human development called the Social Progress Index. 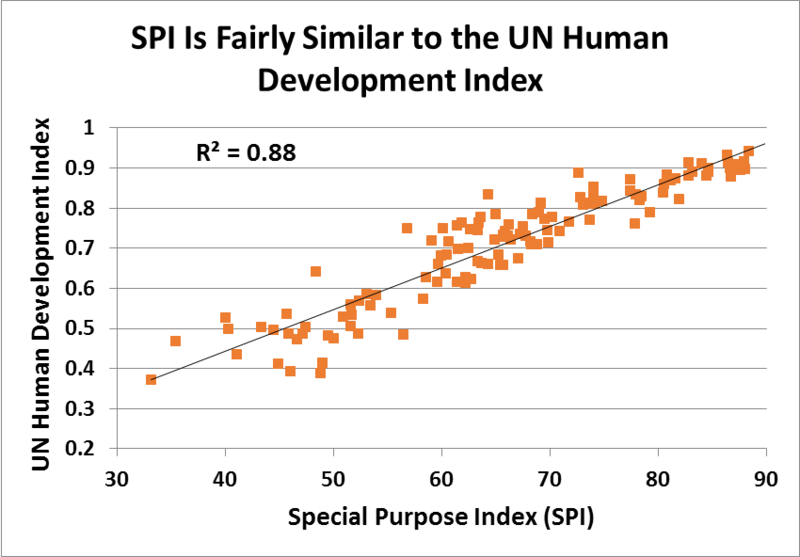 The SPI Index is highly correlated with the UN HDI. The SPI contains more levels of detail than the HDI. (For the SPI, 61 raw value indicators lead to 12 calculated scores that roll up to three dimensions and a final score. The HDI is driven by five measures.) 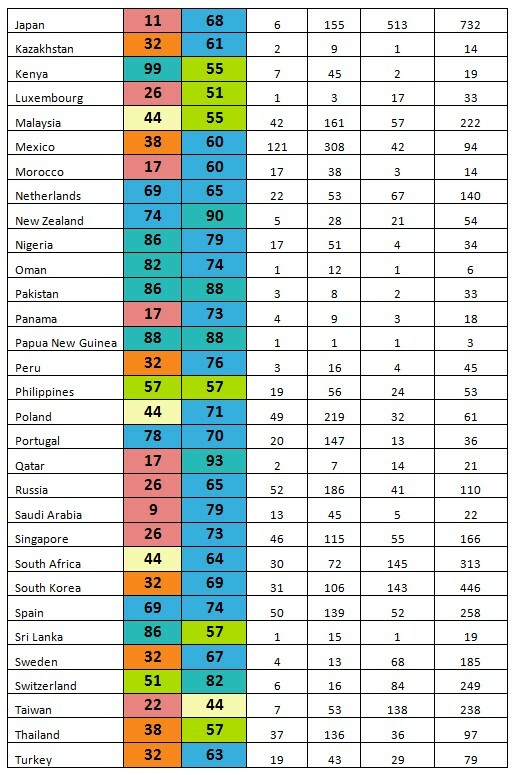 The SPI covers 161 countries—the HDI tracks 199. Both cover more countries than CSRHub (we have data on companies in 132 countries). However, after we throw out the 70 countries where CSRHub does not yet have enough rated companies to generate solid average scores for all four of the categories CSRHub tracks, there is a 57 country overlap with the SPI. 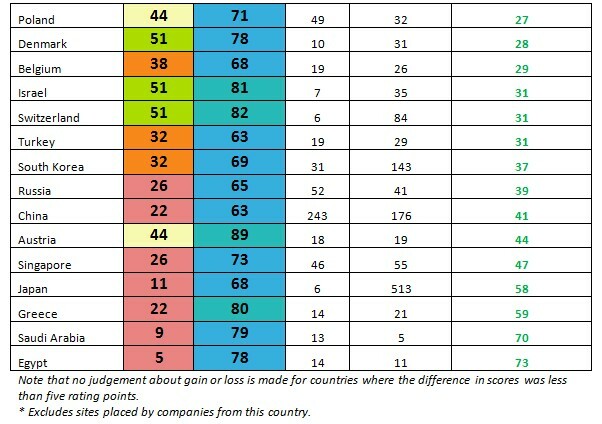 At the most simple level, the SPI score for a country is well-correlated with the average CSRHub ratings for the companies in each country. The r-square of 33% is paired with a F score of 6.5. This suggests a greater than 0.9995 confidence that two data sets are related. 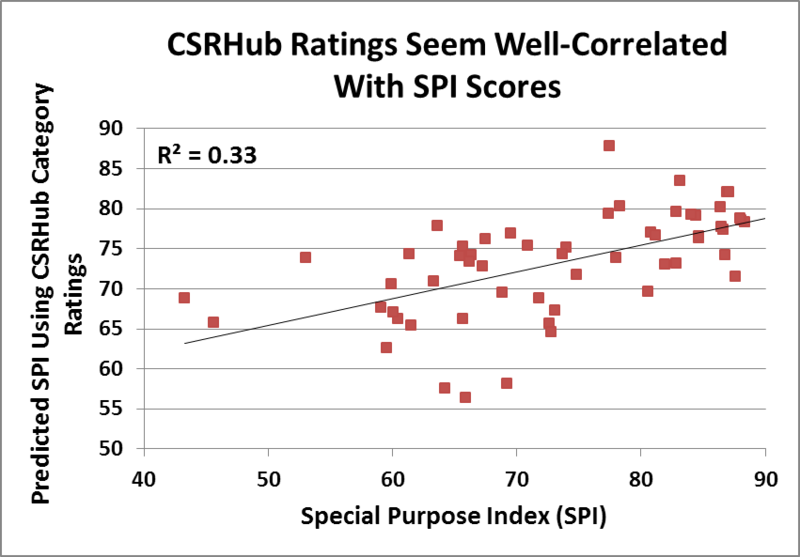 Digging down into the details shows that positive corporate behavior in the community area is negatively correlated with gains in SPI. In contrast, positive corporate behavior in environment areas is positively correlated with gains in SPI. We believe that companies in countries with weak SPI scores have built good community programs to offset their society’s weaknesses. In contrast, companies in the countries with good SPI scores have built up their environment programs, to help improve trust in their activities. The high “P-Values” and small tStat coefficients for the correlations with Employees and Governance ratings indicates that these company programs are not directly tied to the SPI. This makes sense, as the SPI’s indicators are focused on societal issues such as health, literacy, and longevity, not on how well corporations pay their employees, train them, or how well they govern themselves. Still, it is disappointing that there is not a connection between these elements and the SPI. We would have liked to believe that paying one’s employees well and giving them good benefits would improve overall health and well-being. We would also have liked to see a tie between a high standard of ethics within corporations and strong government programs that care for those who are disadvantaged or poor. Note that our study is limited due to the fact that we tie a company solely to the country it is headquartered in. Most of the larger companies we track have operations in multiple countries and often, multiple regions. We are also working with a single year’s data on both companies and countries. Longer term studies may reveal a richer level of detail. With the wealth of data now available via the SPI, there should be many opportunities for further study on the tie between corporate behavior and societal performance. We hope our readers will share any results they uncover so that we can make sure that responsible corporations get fair credit for the social benefits they create within their societies.